What is the new California College Promise Grant? It is the new grant that has taken the place of the Board of Governors (BOG) Fee Waiver. community college students effective for the 2018-2019 award year. You can find all the facts HERE and the flowcharts HERE. Need Help with your Financial Aid Application? SAP workshops are MANDATORY for all students that would like to appeal. Your appeal will not be considered if you do not attend. You may register at the Merritt College Financial Aid Office or by calling (510) 436-2465. Please arrive early and on-time, students that are late will not be accepted. Direct Loan Informational Workshops are MANDATORY for all students that would like to apply for a Direct Loan. 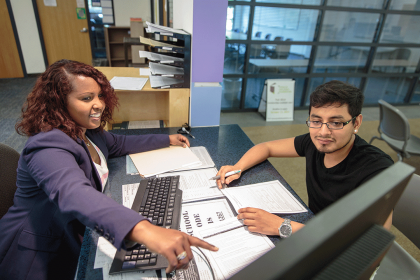 You may register at the Merritt College Financial Aid Office or by calling (510) 436-2465. If you have not already applied to Merritt College, you can do so now by filling out an application here. Through this process, you will be given log-in information for your own student Passport account, which will send all Merritt communications to you, including all financial aid-related notifications. If you are a U.S. citizen or eligible non-citizen, complete the Free Application for Federal Student Aid (FAFSA Form) online. The deadline to apply for most financial aid options is Oct. 23 for the following Spring and Summer semesters. If you miss the March 2 deadline, you can still apply for Fee Waivers, Pell Grants and Loans by filling out the FAFSA. –For one-on-one assistance with any application, please visit the Financial Aid Computer Lab in the R Building, Room 108. The FAFSA form covers only one academic year (Fall, Spring, and Summer), and you will need to reapply the next year. Step 2: Check your Student Email on Passport. About two weeks after you submit your application online, the Financial Aid Office will send a follow-up email to your Passport account with a list of things you need to do. In most cases, there will be missing documents that the Financial Aid Office requires. After you have printed, gathered, and completed all documentation listed, visit the Financial Aid Office in the Student Services (R) Building during drop-in hours to submit your forms. The results of your FAFSA application will be sent by email to your Passport email account approximately 4-6 weeks after your submission to the Financial Aid Office. Financial aid grant award amounts are based on full-time (12 units or more) enrollment for the semester and pro-rated for less time. Once awarded, a financial aid check will be mailed to you on the next scheduled disbursement date. Step 5: Make an Appointment with a Counselor. Once you have determined that you will be getting financial aid and have successfully applied to Merritt College, meet with a counselor to start working on a Student Educational Plan plan and taking the required Assessment/Orientation to determine your math and English placement. Then you will be ready to register for classes right here! If you have questions, please contact the Financial Aid Office at (510) 436-2465.